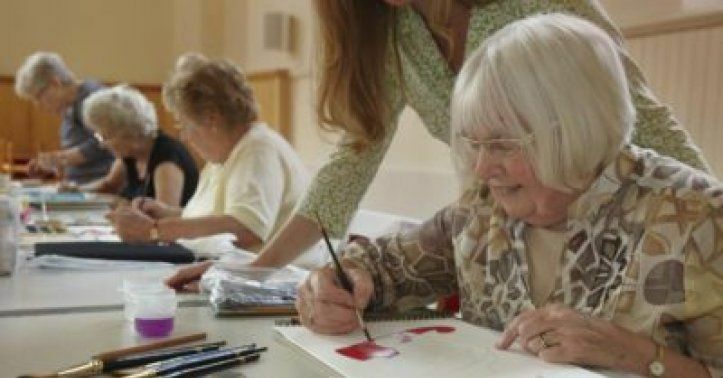 Benefits of Art Therapy for Elderly: Strictly for Adults! How delightful you feel while indulging in artistic activities! They offer a healing effect. It is easy to indulge in activities of your interest. They release pressure off you and, in a way, beat dis-ease. Psychologists and other medical practitioners have demonstrated benefits of art therapy for elderly. They have proved that art changes a person's state of mind as well as their physiology. Art influences a person's neural framework, autonomic sensory system, hormonal balance, cerebrum neurotransmitters and bloodstream. No wonder adults are going crazy over art like never before because of its spiritual benefits! Art has the power to change one's impression of the world. It impacts people's moods in a way. This is particularly true for elderly who experience loneliness, boredom, depression and other medical conditions. Art, in any form, allows people to vent their emotions and heal their minds. Old age is a fragile period where an outlet for self-expression is necessary. Cooking, sewing, weaving, origami, painting, cultivating, decorating, music, collecting vintage articles, verse composing, delivering speeches or shows- everything is an art. Therapeutic art activities for adults are gaining popularity for their healing benefits. In a way, it gives a sense of satisfaction, which medicine fails to do. There is a good reason why medical practitioners and psychologists recommend creative and therapeutic Art activities besides regular treatment. The body is made to heal itself. It recovers best when in a state of deep-felt relaxation. Art and music harmonise body and mind. Creative and therapeutic activities help disclose the original personality of the elderly- the feeling that we are not yet prepared to confront deliberately or can't express. Art Therapy helps us unravel the subconscious thoughts at a pace we can deal with. In some cases, art therapy is done with professional help. Only a few people are happy with communicating their feelings verbally. Notwithstanding for the individuals who express verbally, the utilisation of art frequently prompts a more profound display of their feelings. Here and there, words constrain us. Now and then we experience feelings that we have not verbalised or discovered words for. Often, we intuitively obstruct the outflow of our insecurities and fears for the fear that it will overpower us. Utilising art is an approach to reach those emotions, little by little; to express them somehow and to give them a voice. When we visualise our thoughts through our work of art we can start to comprehend them, and our relationship with own self changes. Benefits of art therapy for elderly are so profound they cannot be ignored. Performance Art - Acting, singing, movement, spontaneous creation, stand-up drama and playing an instrument. Meditation - Through illustration, painting and letters. How can elderly use art as healing therapy? To begin with, create time and space for it (this might be the greatest challenge in the hustle and bustle that surrounds us). In case you are already occupied with a healing procedure, try to fit it your current schedule. You can also incorporate art therapy into your daily or weekly plan, similarly as you would work out. Pick a medium that feels good to you and enables you to express freely. Concentrate on a physical or intense subject matter you need to think upon or make an inquiry. After that let your thoughts flow freely. Try not to stress yourself about making your artistic piece 'perfect'. It's more important to give yourself the flexibility to express what's inside you. If you end up in physical or emotional pain, give art a chance to heal you. Utilise your preferred work of art and express your sentiments, and release the emotions.Utilise it all the time as a "preventive medication." It might sound excessively straightforward, but it does work. While we have come to think about art as a type of leisure activity, and even as an individual interest, a significant number of us have long overlooked that Art offers us chances to recuperate and rejuvenate our mind and soul. Most of us are familiar with art as drawing or sketching activities, which were a prominent part of our childhood. As we grew up, the need to conform to norms overtook our creative streak. Somewhere down the line, we lost track of the satisfaction that artistic activities gave us. Suddenly, engaging in artistry became a waste of time and art was sidelined. It is important to realise the healing benefits of art therapy for elderly as it will make their old-age years golden. Strong scientific evidences support our belief that art is happiness...and happiness is something money can't buy.